Join us for dinner Monday – Saturday. We have plenty of great appetizers if you fancy sharing, and generous mains if you’re a little more peckish! Our menu features Aussie and Canadian favourites like meat pies, pizzas, meatloaf, shepherd’s pie, chicken parmagiana, nachos, wings and more. All prices are subject to change and taxes. Chicken Strips $10.99 – Moose’s famous strips made fresh daily. Served with our own honey mustard dip. Steak Bites $12.99 – 8 oz. of tender Australian striploin tossed with coarse pepper and salt. Potato Skins $9.49- Topped with cheese, real bacon bits & green onion, served with a side of sour cream. Crispy Spud Rolls $9.99 – 4 stuffed potato spring rolls with cheese & bacon bits. Veggie Eggrolls $8.99 – 4 eggrolls with plum sauce. Moose Style Poutine $8.99 Chips topped with gravy & mozza. Moose Wraps $9.99 – 8 tender chicken bites wrapped in bacon. Chicken Kebabs $9.99 – 4 grilled chicken skewers. Choose from hot, Asian or satay. Snag Bites $11.99 – 2 organic, gluten-free pork & leek sausages, sliced, pan seared & served with mustards. Buffalo Chook Rolls $9.99 – Spicy chicken wrapped in spring roll pastry, served with a side of blue cheese. Garlic Prawns & Veggies $12.99 – Six prawns sautéed in Garlic Butter & veggies. Flatbread Pizza $11.99 – Roasted red pepper, red onion & feta on a sundried tomato base topped with balsamic drizzle & chopped spinach. Chook Wings $10.99 – A dozen chicken wings with veggie sticks. Choose from hot, teriyaki, honey garlic, salt & pepper, 911 or Thai sweet chilli. Veggie Plate $8.99 – Assorted veggies with ranch dip. Tortilla Chips & Salsa $5.99. Roo on a Stick $15.99 – 4 herbed marinated kangaroo skewers. traditional damper with blueberry relish. Oz Fries $9.99 – Potato wedges served with sour cream and sweet chilli sauce. Battered Savs $7.99 – Australia’s answer to the corn dog! Mini Sausage Roll $8.99 – 5 Mini sausage rolls. Aussie Meat Pie $10.99 – Homemade pie filled with ground beef, onions & gravy. Served with a side of gravy & a generous portion of chips. 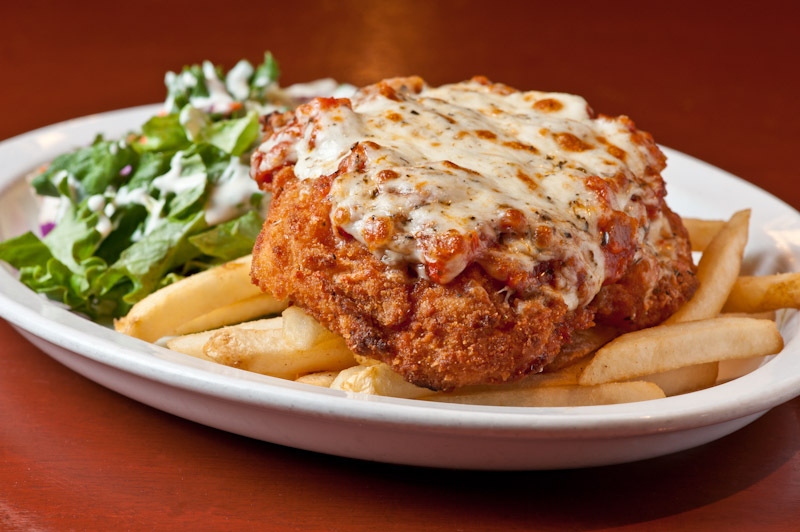 Chicken Parma $16.99 – A breaded chicken breast topped with tomato sauce & mozza. Served with mixed greens and chips. Have you tried our ‘SUPER PARMAS’? Ask your server for the list! Vegemite & Cheese Sanger $8.99 – ‘An Australian staple’ served with cheddar on toasted white bread. Served with your choice of mixed greens or chips. pineapple, beetroot, egg, cooked onions, lettuce, tomato & mayo. Served with your choice of mixed greens or chips. Steak Burger $14.99 – Thin 6 oz. steak topped with onions & smothered with our Australian style BBQ sauce, lettuce & tomato. Served with your choice of mixed greens or chips. Roo Burger $14.99 – 100% kangaroo meat patty cooked medium rare with lettuce, tomato, mayo & blueberry relish served on a Kaiser with your choice of mixed greens or chips. 8″ Pizza Aussie Style $10.99 – Ham, red onion & red pepper, topped with a fried egg. All of our soups are made daily from the freshest ingredients & served with garlic bread. Minestrone $5.49 -Tomato based, vegetarian. Pumpkin Soup $5.49 – Served with a dollop of cream. Veggie Beef $5.49- A Moose’s favourite. Daily Soup $5.49 – Ask your server. Soup & Salad $14.99 – With Caesar, Greek or Chef. $16.99 – With Coral Bay, Aussie Caesar, Baja or Quinoa. Aussie Caesar $13.99 – With bacon, anchovies and crumbled egg. Greek $13.99 – Diced tomatoes, bell peppers, red onions, cukes & black olives tossed with our own vinaigrette & a generous portion of feta. Black Bean mixed with chili lime dressing and salsa and topped with corn chips. Chef $13.99 – Mixed greens topped with strips of ham, turkey, Swiss cheese, tomatoes, mushrooms, cukes, egg & your choice of dressing. Baja Steak $13.99 – Mixed greens tossed with homemade chilli lime dressing, topped with roasted red peppers, corn, black beans and steak. Served with your choice of mixed greens or chips. ‘DUD’ Down Under Deluxe $11.99 – 6 oz. freshly made ground chuck patty with fried onion, lettuce, tomato, mayo & mustard. ‘Big DUD’ $13.99 – Same as the DUD but with bacon, cheddar cheese & mushrooms. Schnitzel $12.99 – Traditional breaded pork cutlet with fried onion, lettuce, tomato, mayo & mustard. Mexi Chook $13.99 – Grilled chicken breast with corn & avocado salsa, mayo, lettuce & tomato. Salmon Burger $14.99 – Grilled wild Coho salmon fillet dusted with Aussie lemon myrtle spice, with lettuce, tomato & mayo. Veggie Burger $12.99 – Garden burger with lettuce, tomato, onion, cukes, sliced avocado & mayo. Australian Striploin Steak (8oz) $23.99 – A little bit of Down Under served with seasonal veggies, mixed greens & your choice of roasted, mashed or baked potatoes. Gold Coast Chicken $22.99 – Grilled boneless chicken smothered with sundried tomato & avocado cream sauce. Served on a bed of wild rice, seasonal veggies & mixed greens. Wild Salmon $23.99 – Grilled wild Coho salmon with a dusting of lemon myrtle spice, served with rice pilaf, seasonal veggies & mixed greens. Meatloaf $14.99 – Two thick slices of homemade meatloaf, served with creamy mashed potatoes & topped with gravy. Served with mixed greens & garlic bread. Shepherd’s Pie $14.99 – A generous portion of homemade shepherd’s pie topped with gravy and served with mixed greens & garlic bread. Schnitzel Parmesan $12.99 – Breaded pork cutlet topped with tomato sauce & mozza, served with mixed greens & garlic bread. 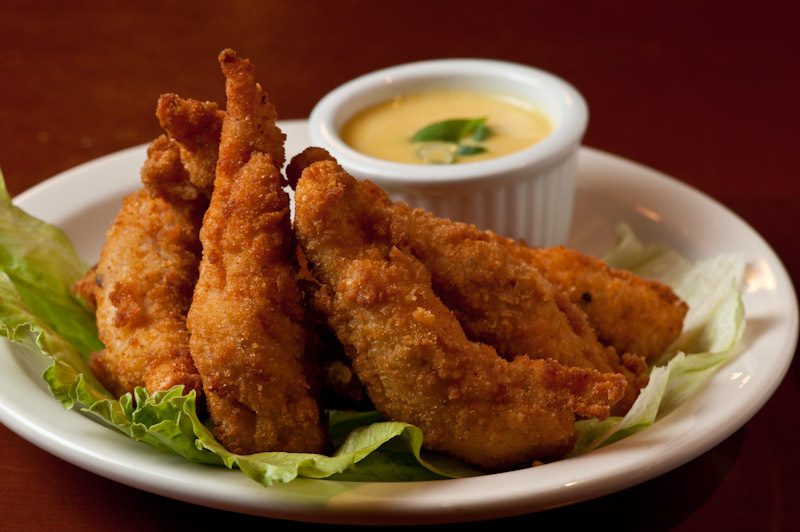 Chicken Strips & Chips $13.99 – Moose’s homemade chicken strips, served with mixed greens, chips & our own honey mustard dip. Fish & Chips $15.99 – Lightly battered New Zealand Hoki, served with coleslaw & our homemade tartar sauce. ‘Wok-about’ Rice Bowl $12.99 – Bell peppers & fresh seasonal veggies on rice with our special Asian sauce. Served with mixed greens. Bangers ‘n Mash $16.99 – Two local, organic, hormone-free pork & leek sausages, served with mixed greens & creamy mashed potatoes, topped with onion gravy. Your choice of spaghetti or penne. All pasta served with mixed greens and garlic bread. Tomato $11.99 – Homemade traditional tomato sauce. Meat $12.99 – Traditional Bolognese sauce, need we say more? Roasted Veggie Lasagna $14.99 Homemade lasagna with peppers, zucchini, spinach & ricotta cheese. Meat Lasagna $1499 – Homemade beef lasagna with traditional spinach & ricotta cheese. Made with our special sauce & seasoned mozza cheese. Add a canadian caesar or mixed greens $3.99, or a Greek salad $4.99. House special 8″ $11.99, 12″ $21.99, 15″ $23.99 – Pepperoni, salami, ham, mushrooms, green pepper, onions & tomato. Veggie 8″ $10.99, 12″ $20.99, 15″ $22.99 – Mushrooms, green pepper, onion, black olive & tomato. Create your own 8″ $9.99, 12″ $17.99, 15″ $19.99 – your choice of 3 toppings. Extra toppings $1.29.